The combination of these two delicate and calming herbs will settle your nervous system and relax your digestive system, especially if you’re feeling stressed or tense. 1. Put the lavender and chamomile in a teapot. Pour over the water, then add the lemon juice. 2. Infuse for 10 minutes, then pour into mugs or glasses (or strain it if you prefer) and serve. 1. Whizz the water, almonds and vanilla in a blender until smooth. 2. Strain through a fine sieve, reserving the almond pulp to use again. 3. Sweeten the almond milk with stevia to taste then pour into an airtight sterilised container and keep refrigerated for 4–5 days. *To pre-soak nuts leave them in a bowl of filtered water for 2–3 hours. Note: You can make more almond milk by adding the almond pulp to the blender with more water (this can be done up to three times). The almond pulp will keep in a sealed container in the fridge for up to 3 days. Turmeric is one of the most thoroughly researched plants in existence, with more than 5,600 peer-reviewed biomedical studies indicating its preventative and therapeutic applications, particularly the role of its wonder ingredient curcumin in decreasing inflammation. 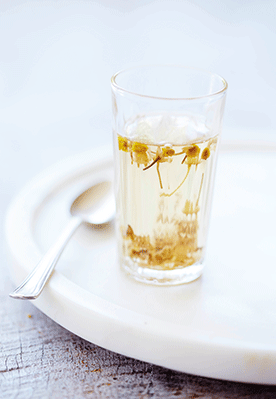 This gorgeously golden tea is a wonderful way to savour its medicinal benefits. 1. Heat the almond milk in a small saucepan until it reaches room temperature. 2. Put the turmeric and ginger in a mug. Pour a small amount of warm milk over the spices in the mug and stir to create a liquid paste, ensuring there are no lumps. 3. Add the remaining milk, stirring well, and sweeten with stevia. Recipes taken from Heal Your Gut by Lee Holmes (Murdoch Books, £14.99). Photography by Cath Muscat.